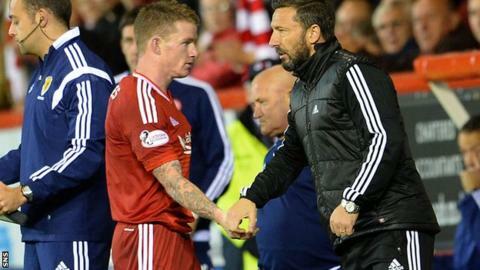 Winger Jonny Hayes claims manager Derek McInnes has spared the Aberdeen players the worst of the flak aimed at them over their faltering title bid. The Dons won their first eight Scottish Premiership matches to top this season's table yet have since taken only one point from a possible 12. "You take the good and the bad," said Hayes, 28, ahead of Aberdeen's game at Celtic Park on Saturday lunchtime. "The manager deflects stuff and takes the brunt of it if there's criticism." And the Irishman added: "He has always done that for us. He doesn't let outside opinion affect us, whether it be good or bad. "On Monday morning when we come in we focus on the next game in hand. That has always been the way we have gone about our business and it has been no different this week." While the Dons' Premiership challenge has withered, Celtic have amassed 10 points from their last four league games and now lead the Reds by four points as they chase a fifth consecutive title. Hayes, yet to score after 11 league appearances this season, was sent off when Aberdeen defeated Celtic in their first meeting this season. He believes they will need to rediscover that sort of form to trouble Ronny Deila's team in Glasgow. He said: "It's about the hardest match of the league campaign. We are well aware of the challenge that awaits. "When we beat them at Pittodrie we played very well, going down to 10 men as well. "If we are going to win we will need to produce a performance like that. "It's a big game but it's three points, at the end of the day. We need to go there looking to get back to winning ways. "It's one you look forward to, playing on a good pitch. We'll certainly have a good support following us down. "Every team in this league that goes to Celtic Park is always the underdog. It's down to Celtic's success. Going there as the underdog maybe suits us. Celtic are expected to win in front of their own fans so if we can upset that we will be happy."